Abercromby Square, photograph by Stephen Richards, Liverpool, England, 2011. The elite occupants of Liverpool's Abercromby Square were particularly active in economic, military, and political activities surrounding the U.S. Civil War. An overview of the history of this neighborhood and its residents provides insights into how it became a base for Confederate support in Great Britain. At the beginning of the nineteenth century, the port city of Liverpool was expanding at a phenomenal rate. This growth was primarily due to the ever-increasing quantities of American cotton required to supply new mills in manufacturing strongholds throughout Lancashire, and in particular in the city of Manchester. In the process, the ranks of wealthy Liverpool merchants were growing, and they were relocating to new areas of the expanding city. On the eastern boundary of the old township, developers reclaimed land over a former peat bog, and laid out a carefully designed residential neighborhood around the central feature of Abercromby Square. Placed between the new Wellington Assembly Rooms and the prestigious Botanic Garden, the Square became home to the wealthy elite of Liverpool. 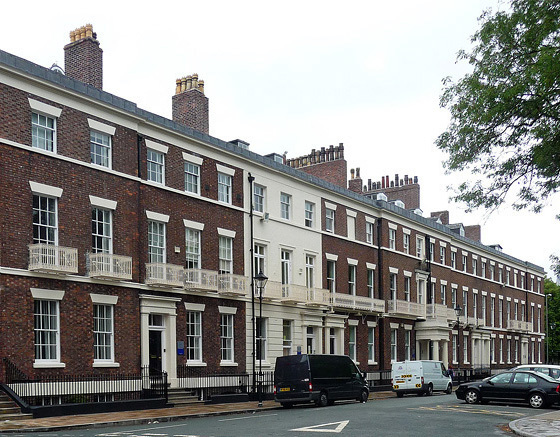 By 1837, Abercromby Square was almost complete, and was seen as the most fashionable place to live in town. Only the wealthiest could afford a home in this neighborhood, which inevitably meant that the majority of Abercromby's merchant residents were connected with trans-Atlantic commerce. In particular, many merchants who lived in the Square promoted trade with the U.S. South, and became central figures in the "Southern Club" for Liverpool businessmen. As a result, there was a great deal of Confederate support in Abercromby Square. The business interests of the occupants ranged from law firms, merchants, cotton brokers, and insurance agents, to customs officers, bankers, and shipowners. Nearly all of them found opportunities for profit both during and after the Civil War. Still, Confederate sympathies did not exclude business dealings with the North. Many Liverpool businesses traded with both sides during the war.